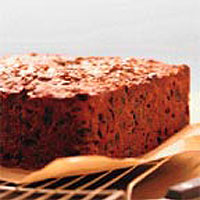 The secret to creating a rich moist fruit cake is to start early - fruit cakes will improve with keeping. This recipe is best made 2-3 months before Christmas Day, in October or November. The day before you are going to bake the cake, soak the dried fruit in the Drambuie and orange juice and leave overnight. This ensures that the fruit is plump and moist when it is mixed into the cake. Once the cake is baked, feed with Drambuie every 2-3 weeks until Christmas. Place all the fruit in a large bowl, stir in the orange zest and juice, and the brandy. Cover and allow to stand overnight. Preheat the oven to 150°C, gas mark 2. Prepare a 20cm square cake tin by lining the base and sides with a double thickness of baking parchment, cut so it comes 5cm above the edge of the tin. In a large bowl, use an electric whisk to cream the butter and sugar together until pale and fluffy. Add the eggs, one at a time, beating well between each addition. If the mixture begins to curdle, add a tablespoon of the flour. Add the soaked fruit, nuts and any liquid and stir well. Then carefully fold in the flour. Use kitchen string to secure a double band of brown paper around the outside of the tin. Stand the tin on several sheets of newspaper or brown paper - this prevents the sides and base of the cake becoming too dry, over cooked or scorched before the centre is cooked. Place in the preheated oven for 3-4 hours, until cooked. To test, insert a fine warm skewer into the centre, if it comes out clean the cake is cooked. If the cake is becoming too dark, cover with a square of baking parchment. Leave to cool completely in the tin before turning out onto a wire rack. To line a cake tin: grease the tin with a little melted butter. Cut a double strip of parchment paper approximately 15cm high and 85cm long. Fold back about 2cm lengthways and snip at regular intervals. Press snugly around the sides of the tin with the snipped edge on the base. Cut 3 squares of parchment to cover the base of the tin. If a dome forms during cooking, just before decorating the cake, neatly slice off the top for a smooth flat surface. Every 2-3 weeks, prick the surface of the cake with a fine skewer and spoon over 2 tbsp Drambuie. Feeding the cake in this way, as it matures, ensures a moist cake. Do not to overfeed, otherwise the cake will become soggy and more like a Christmas pudding. Store the Christmas cake in a cool, dry place wrapped in greaseproof paper and then a double thickness of foil. The alcohol in which the fruit is soaked evaporates during cooking. If you would prefer not to use any alcohol, soak the fruit overnight in an extra 100ml freshly squeezed orange juice instead of the Drambuie. Feeding the cake with Drambuie once it is cooked is optional.